Seems like this chicken went mad and not she is throwing her unborn kids away! Destroy all eggs on each level by shooting them with your slingshot! Have your mama ever told you that you should not throw food? This chicken went further and she gave you her eggs to smash other eggs with them. She is definitely a bad mother. 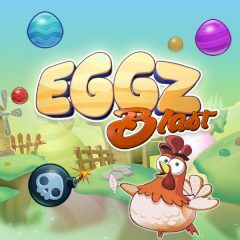 Your main goal is to destroy all eggs you see, however, you can do it in one shot aiming on the wooden board. Good luck to you!